WASHINGTON, D.C. – October 14, 2016 – (RealEstateRama) — The Insurance Institute for Business & Home Safety (IBHS), the California Fair Plan Association, AonBenfield Company and Renaissance Re sponsored a California Executive Summit on Wildland Fire October 5-6 in Los Angeles. More than 50 top insurance executives from property and casualty and reinsurance companies across America attended the highly anticipated event. 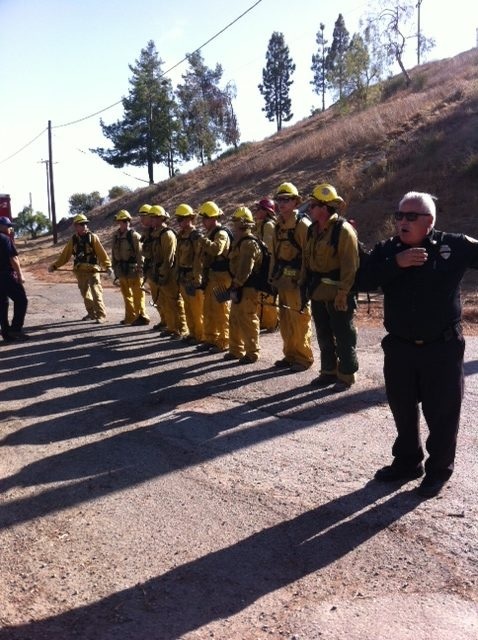 Attendees were introduced the first day to the fire prevention and suppression capabilities of the Los Angeles County Fire Department by J Lopez, Deputy Fire Chief of the L.A. County Fire Forestry Division, and Vice-Chair of the California Fire Safe Council. The group visited the Malibu Fire Station on Pacific Coast Highway. They then viewed demonstrations at Station 8 of firefighting on hillsides, and a look inside one of the three Blackhawk helicopters that carry water, supplies, firefighters and rescue missions throughout L.A. County. Chief Lopez also explained the enormous fire prevention and suppression responsibilities of federal, state, local community residents, businesses, fire, law and government agencies covering millions of acres of land in California. Annelise Livon, FAIR Plan President, explained that the Fair Plan is a private association based in Los Angeles comprised of all insurers licensed to write property insurance in California. All insurers conducting property business in California must be a member of the Association. The California FAIR Plan insures property owners who cannot obtain insurance in the private marketplace. Profits and losses are shared by its members in direct proportion to their market share of property insurance written in California. Jerry Davies, Chair, California Fire Safe Council reviewed the Council’s history and how the concept of Fire Safe Councils protecting communities in California through fire prevention programs has grown to more than 150 Fire Safe Councils today. He explained since incorporation in 2004, CFSC has issued more than $95 million in grants to Fire Safe Councils, fire agencies and community organizations. He invited the insurance executives to visit www.cafiresafecouncil.org to learn how CFSC works with Fire Safe Councils throughout the state. Davies invited the insurers to get involved in the activities of the local Fire Safe Councils through the California Fire Safe Council. A fire science presentation was presented by Dr. Jack Cohen, Research Physical Scientist from the US Forest Service, retired. Dr. Cohen co-developed the U.S. National fire behavior prediction systems and conducted research on live fuel fire behavior in southern California chaparral. He currently is conducting theoretical research to understand the fundamental ignition processes of wildland fire spread. Other presentations included Bob Roper, former Ventura County Fire Chief, Oregon Fire Marshal and now with the International Association of Fire Chiefs and several insurance company representatives who explained their roles in insuring property and business owners in the state. Ken Allen, Deputy California Insurance Commissioner explained how the department works with California insurers and homeowners in WUI areas in the state to keep insurance available. Brenda O’Connor, SVP, IBHS urged all of the insurance companies present to join IBHS, the Fair Plan, CFSC and other fire safe groups in the state to help in building fire resistant property and ensuring fire prevention projects in local communities. A very interesting and fact filled two-days. For further information, contact CFSC.